The Stony Brook women’s soccer team continued a pattern of alternating wins and losses with a 1-0 defeat to Notre Dame on Thursday, Aug. 23 and a victory against Seton Hall with a 1-0 victory on Sunday, Aug. 26. Thursday’s lone Notre Dame goal came just 39 seconds into overtime. The Fighting Irish attack applied pressure on the Seawolves in the opening seconds of overtime. Sophomore defender Jenna Winebrenner led a charge that finished the match as she crossed a ball from the left end for freshman midfielder Kelly Moss, who headed the golden goal home. Notre Dame’s offense tallied for 20 shots in the matchup, 13 more than Stony Brook as well as doubling the amount of free kicks 8-4. Notre Dame appeared to have taken the lead in the 67th minute after a headed ball made its way into the Stony Brook net; however, the play was whistled offside and the game remained scoreless. The loss comes after a Seawolves overtime victory against Oregon State on Sunday, in which the team displayed a larger offensive stride, doubling the amount of shots on net with two goals. Sophomore goalkeeper Sofia Manner saved six shots on seven faced, including a diving stop off her wrist to keep Notre Dame off the scoreboard in the early portion of the first half. Manner is currently second to the University of New Hampshire’s graduate goalkeeper Mia Neas for most saves in the America East through four games with 24 and poses the second-highest save percentage in the conference with 86 percent. The Seawolves headed into halftime with just one shot recorded, while the Fighting Irish put up nine. The sole shot did generate an opportunity, however. Sophomore midfielder Kimmy Chavkin’s corner kick found senior defender Allyson Baner for a header, but it was blocked by the Fighting Irish defense. Stony Brook was able to pick up their second victory of the season on Sunday against Seton Hall with just four shots on net. Freshman midfielder Mari Brenden scored the only goal of the contest in the 76th minute after a two-on-one opportunity alongside sophomore forward Michaela Goglia. The Pirates put pressure on Manner as numerous first-half opportunities nearly slipped past her, including sophomore defender Dani Brinckman’s shot in the 15th minute from outside of the box. 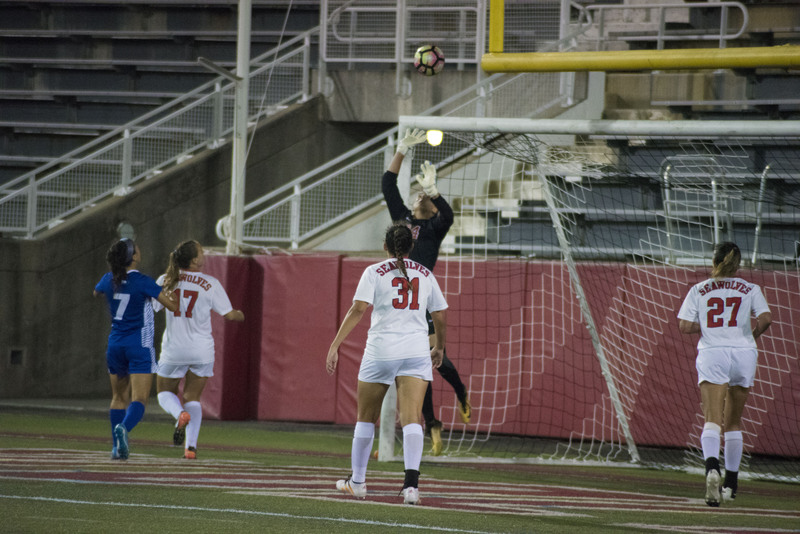 In the second half, Manner’s collision with a Seton Hall player almost allowed the ball to cross the goal line, but she recovered to make the save. The Finnish goalkeeper picked up her first clean sheet of the year and the sixth of her career with three saves. Stony Brook headed into the locker room at halftime with two shots and a corner kick to its credit. The team stepped up the pressure in the second half, adding five more shots as well as being more aggressive, more than tripling their foul count from two to eight. The Seawolves start the season 2-2 for the second consecutive year. The team continues its six-game road trip against Boston College on Wednesday, Aug. 29 at 5 p.m.